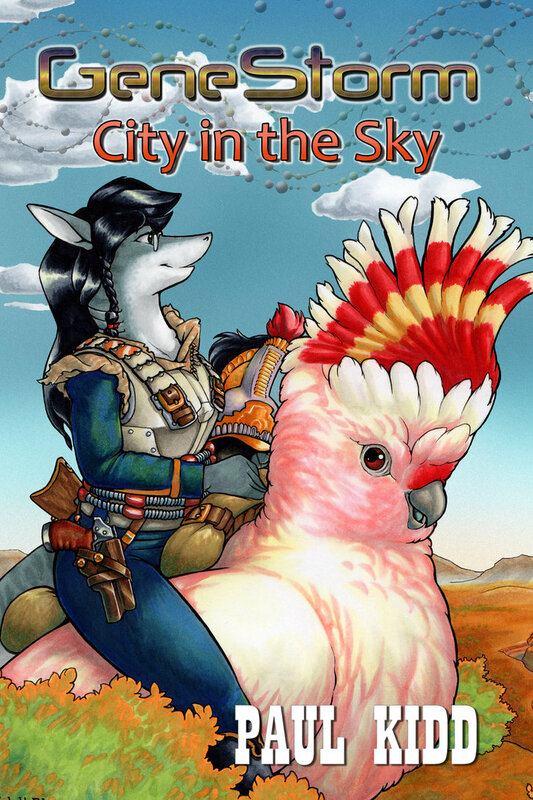 GeneStorm: City in the Sky, by Paul Kidd – book review by Fred Patten. Raleigh, NC, Lulu.com/Perth, Western Australia, Kitsune Press, May 2015, trade paperback $26.37 (420 pages), Kindle $7.99. Somebody sniffed that they would never read a novel hacked out as a RPG merchandising spin-off. Your loss. Kidd writes fun furry adventures. “Snapper ate the salty dough, dunking it in a cup of brown onion gravy. “I met a toucan once. Sort of part cat, part bird.’ […] ‘Now she married a guy that was a sort of strawberry-dog hybrid. Well – their kid sort of stayed a cat toucan. But his feathers were al red and green strawberry colours. Pretty striking.’” (pgs. 64-65). “Something utterly weird suddenly bustled into view: something pink and elegant and with far too many limbs. Quite definitely female, if her build was any guide. She may have been a mantis – but no mantis Snapper had ever seen had quite so floral a carapace, nor a head quite so pointed at the eyes. The woman had four arms – two fitted with hands, the other two with rather alarming serrated claws. She pointed one of these excitedly towards the nearest wagon, seizing Snapper in one delicate pink-white hand. Another hand seized the fox-pheasant, dragging him along through sheer moral force. There is a 12-page race of the wagon train to reach the town before the Screamers catch them that’s similar to scenes in Westerns of settlers trying to outrace the Indians, except that these caravaners have animal talents, and the wagon train is carrying supplies for Spark Town’s weapons – guncotton, acid, and stuff. They make a bomb. What wonders will they find? Maybe even the fabled flying city. Legend has it that when the GeneStorm plague engulfed the old civilization, its last leaders sealed themselves and their families aboard a technologically-advanced huge airship that never had to land, and flew above the plague. But that is just fable, and besides it was 150 years ago. The flying city couldn’t still be up there! Could it? That’s the first three chapters. Chapters 4 to 19 are what happens to them, and what they find. You know that you want to find out with them. “The mantis looked wanly back toward the crater. A cracking, page-turner of a novel! Wild hussar charges, savage mutants, majestic vistas and colourful characters. If you like the novel, and you play RPG games, look for the GeneStorm RPG by Kitsune Press at http://paulkidd.net/kitsune-press/. Was the book any good? What did you think of the characters? Does it work as a story or is it just a bunch of weird characters for the sake of having weird furry characters? How is the pacing? I gotta admit I’m a little disappointed in this because it seems more like an advertisement for the book than a sincere review. I enjoyed it tremendously! It’s weird but fun. It’s well-paced; fast-moving and exciting in the action sequences, but it does slow down to let you relax and get to know the folks of Spark Town, or to marvel at what Snapper finds in her explorations. It never takes itself seriously, or expects you to. You never know what kind of mutants to expect next. The true monsters (it makes you think about who just looks funny and who’s really mindlessly feral or consciously evil) are seriously deadly. There’s genuine suspense. The characters like Snapper, Kitterpokkie, Captain Beau, and their friends and associates are well-developed; not just grotesque cyphers. They’re all intelligent, including the villains; they have to outwit as well as outfight each other. Spark Town, despite everybody in it being a different mutant, feels like a frontier community like the 19th-century town of the average Western novel. (Yes, I’ve read Westerns in my time.) I hope that Kidd will write a sequel; I’d like to read the further adventures of Snapper, Onan her cockatoo, and their friends.